On Wednesday August 4, Caroline Giuliani was arrested for shoplifting at an Upper East Side Sephora. I saw the story, noted that Sephora did not want to press charges because of who she was, and just chalked it up to the privilege (or curse, depending on who you ask) of having a powerful father like Rudy. To be honest, I just put a snarky little thing on my Facebook page and moved on, seeing myself as above writing about such gossipy things. Then Caroline's estranged father had to open his hypocritical mouth. In typical fashion, Rudy Giuliani feels that the laws of hypocrisy do not apply to him. Giuliani's spokesman stated, "This is a personal matter and Mayor Giuliani asks the media to respect the privacy of his daughter at this time." More forcefully Giuliani himself said, "It's a private matter. And, it's going to stay that way." If only Rudy felt that way when other people's criminal records were in question. Many of us remember Patrick Dorismond. He was shot during the early morning of March 16, 2000 after an undercover officer propositioned Dorismond to buy some marijuana and things escalated from there. Dorismond was fatally shot in the chest, with the bullet rupturing his aorta and going through his right lung. This is when Giuliani began his smear campaign against Dorismond while praising Officer Anthony Vasquez, Dorismond's killer. Giuliani released Dorismond's juvenile criminal record, the sole content of which involved a dust-up with a friend over a quarter (charges were dropped.) Giuliani said that Dorismond was "no altar boy" (which, ironically, he was) and that he spent a "good deal of his adult life punching people," referring to a domestic complaint by Dorismond's girlfriend which resulted in no charges. Meanwhile, Giuliani praised the man who killed Dorismond. 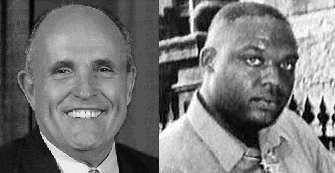 Officer Anthony Vasquez, according to Giuliani, was a "very, very distinguished undercover officer." Some of Vasquez's accomplishments off the job? He shot a neighbor's dog and pulled out his gun during a fight at a bar. Of course, Giuliani could not stop blaming Dorismond for refusing to sell marijuana to an undercover cop and getting shot for it even after a grand jury refused to indict Officer Anthony Vasquez. Shortly after the grand jury refused to indict, Giuliani stood before a mostly black audience in Crown Heights and told them that Dorismond essentially killed himself because of the way he acted that morning. In what seems to be the norm for the shooting of unarmed black men by the city's police force, federal officials declined to press civil rights charges against the officers involved and the city settled for seven figures out of court with Dorismond's family. So what does this have to do with Caroline Giuliani? Nothing, until Rudy Giuliani says that her crime is a "private matter." Pending criminal charges are not a private matter; in fact, they are a matter of public record. A debate in my hometown recently highlighted the fact that it is public record when an individual is charged as an adult, as Caroline Giuliani is. The precedent in New York has been set by its previous mayor: not even one's juvenile record is safe if the right (or wrong, again it's how you look at it) people want to get at it. It would be nice if the Giuliani family could resolve this issue with the courts in a relatively private manner. It would have been even nicer if the Dorismond family could have grieved over their loved one in the same way.